The MXL4 Precision Locator represents a significant advance in cable detecting and tracing capabilities. Two versions of the MXL4 are available; the MXL4-D which has full data logging capability, and the MXL4-DBG which has full data logging capability, Bluetooth™ connectivity and GPS. Innovative new features have been introduced enabling the MXL4 Locator and MXT4 Transmitter to provide high-end precision performance and a far more flexible approach to pipe and cable location. 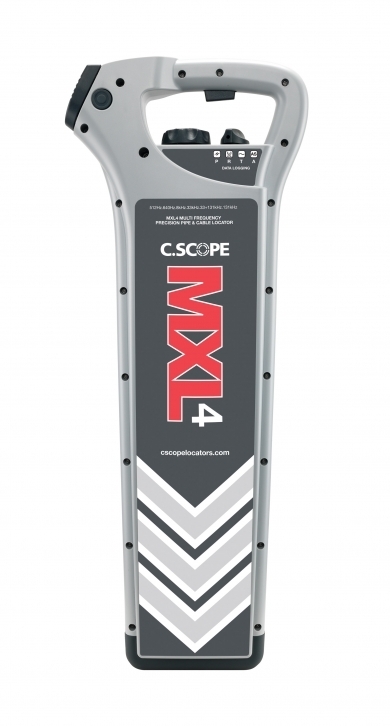 The MXL4 is able to quickly and accurately detect, pinpoint, trace and identify the widest range of pipes and cables. Optimised Locator Sensitivity and Noise Rejection means that the MXL4 can deal with the highest levels of background interference found, allowing even the weakest of signals to be detected successfully. The MXT4 Transmitter now has a greater range of transmitting frequencies allowing improved long distance tracing and utility identification, even on the most congested of sites. A range of frequencies from 512/640Hz up to 131kHz and including the simultaneous dual-frequency 33kHz and 131kHz signal output is ideal for maximising the number of buried services that can be energised and then detected. The MXL4 can apply these frequency signals without direct connection to buried services, using either a Signal Clamp or the simple induction method from ground level, providing a significant improvement in the detection of the smaller diameter or poorly earthed cables. The MXL4 when used alongside an MXT4 Transmitter will measure and indicate the depth of buried pipes, cables and sondes at the push of a button. The MXL4 can monitor the true strength of the MXT4 Transmitter signal applied to a buried service irrespective of its depth. This is ideal for identifying the layout of a pipe or cable network. The MXL4-D and MXL4-DBG Locators have full data logging capability. A years worth of data can be stored, in normal usage, on both the Locator and the MXT4 Transmitter. The MXL4-DBG with in-built GPS allows a record to be kept of exactly where the Locators have been used that can then be viewed in partnership with Google Earth™ or Google Maps™. The MXL4 Cable Avoidance Tools do not require periodic recalibration. A fully Automatic Daily Self Test (ADST) tests and confirms that they are functioning at their optimum level each day. The MXL4 has a large, clear and easy to read backlit LCD mounted behind a protective polycarbonate lens. The display indicates detection mode, signal peak level, depth, signal strength and battery condition. It also displays the Automatic Daily Self Test results. The MXL4s twin wall construction is robust and durable. It also provides IP65 standard protection against dust and water ingress.